Don't worry, it's just Photoshop. Bad Photoshop. If the current high price of crude oil makes American motorists cringe (even if their gasoline costs are the lowest in the developed world), fans of Sistema should derive some solace in knowing that those petro-dollars are helping fuel the Fundabol and its remarkable growth. Numbers from Venezuela always seem to be as slippery and as fluid as the nation’s economic lifeblood, but the most recent information suggests that the total budget of Sistema in FY 2010 was approximately $121,000,000. As a lump sum – disbursed in temporarily depressed US Dollars, not catastrophically devaluing Bolívars – it certainly sounds generous, until the massive scope of the program is considered and the 33% growth in núcleos and the subsequent expansion of student population is factored in. With a national program enrollment well over 300,000 individuals, the per-capita allocation becomes a far less impressive proposition at probably only $300 to $350 per student per year. 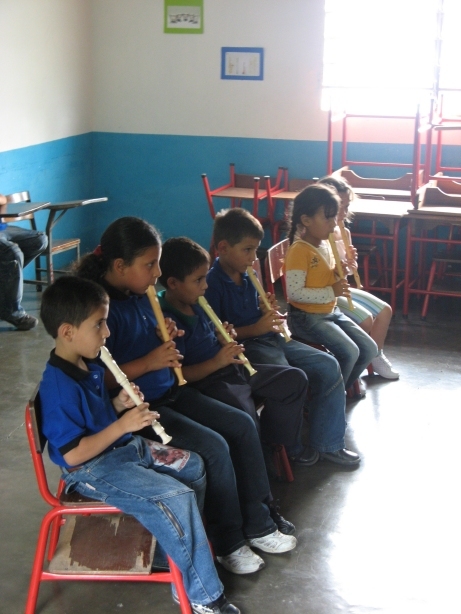 Distribution isn’t perfectly even, of course: a preschooler learning recorder requires far fewer resources compared to a musician in the Orquesta Símon Bolívar, just as a preschooler learning recorder in Caracas is considerably less expensive to teach than a preschooler in Chiguará. In the same way, making realistic comparisons across international borders is challenging, if not impossible. Notwithstanding the Venezuelan government’s convoluted foreign exchange policy and renewed attempt at complete market regulation (which contrary to its purpose continues to drive inflation), regional economics and labour markets can significantly influence program costs. So can objectives, for that matter. My remarks in my previous posting on the profligacy of the Mississippian juvenile corrections system in comparison to California were offered devoid of any context: it could well be that Mississippi devotes significant resources to rehabilitation and has greatly reduced rates of recidivism, whereas California is only concerned with incarceration. Although that example is purely speculative, the same lens can be applied to Sistema programs: what they attempt to provide beyond purely musical experiences is as important as program hours, frequency and longitudinal duration. Sistema Scotland has an annual budget of approximately £470,000 ($770,000 USD) per annum, but with 200 or so program participants, the outlay per students is £2300 ($3800 USD) per fiscal year. Granted, the pound is often described as the “most overvalued currency” in the world, but Big Noise also endeavours to make available to students and families a full array of health care professionals and social workers as part of their mandate. Whether the whole with music is greater than the sum of its parts has yet to be seen: hopefully by the time of the next formal evaluation of Big Noise, we should be able to tell if all that Sterling has done sterling work in Stirling. And in the middle of the spectrum imperfectly defined by the examples of Venezuela and Scotland are those programs offering 2-3 hours of music instruction, twice a week over the school year, with little more. In many North American markets, the cost per child for something like this might be $2000 per year , which is still quite expensive, actually, when the average expenditure to put a child in school for a full academic year is about $10,000 in the US. All this begs many questions. Is it possible – or even desirable – to achieve economies of scale? Are social benefits greater in large groups or in smaller, more compact sub-communities? Should programs cast wide nets and aim to reach as many individuals as possible, or focus intensive resources on just a few individuals of greatest need and at greatest risk? There are no simple answers – but there are more thoughts to come by the end of the week. El Sistema has been going a long time now. It certainly looks great! What research exists that it has achieved its economic and social inclusion goals, as set out at the beginning? Have the goals changed over time? Sistema New Brunswick is also working on an evaluation of their program. Which should have a report out in 2012. One of the primary research resources is the InterAmerican Development Bank study published in 2007. It was part of the bank’s due diligence in advance of a $150 million loan to Sistema – so you can imagine, they were quite diligent with that much money on the line. Also check out the evaluations of Sistema Scotland, which although is a much younger program, is showing some very positive indicators.